Background and Aim: The combination of cetuximab with platinum and 5-fluorouracil (5-FU) chemotherapy prolongs survival in patients with metastatic or recurrent squamous-cell carcinoma of the head and neck (SCCHN). Biweekly (once in 2 weeks) administration of cetuximab requires fewer hospital visits and decreases treatment costs; therefore, it is more convenient both for the patients and for the healthcare providers. Here, we assessed the efficacy, safety, and tolerability of an alternative biweekly regimen of cetuximab in combination with platinum and 5-FU chemotherapy as a first-line treatment for these patients. Methods and Materials: Medical records of patients with metastatic or recurrent non-nasopharyngeal SCCHN who were treated with a biweekly regimen of cetuximab (500 mg/m2 on day 1), cisplatin (40 mg/m2 on day 1) or carboplatin (target area under the curve 3.5 mg/ml × min on day 1), folinic acid (400 mg/m2 on day 1), and 5-FU (400 mg/m2 bolus on day 1 followed by continuous infusion of 2,400 mg/m2 5-FU over 46 h) were retrospectively reviewed. Survival estimates were calculated with the Kaplan–Meier method. Results: In total, 60 patients were included. The median age of the patients was 60.5. The objective response rate was 53.3% (95% confidence interval [CI] = 40.7–65.9). The median progression-free survival duration was 6.8 months (95% CI = 5.5–8.1) and the median overall survival duration was 13.3 months (95% CI = 8.4–18.2). The most common grade 3 or 4 adverse events were neutropenia (28.3%) and leucopenia (13.3%). Grade 3 or 4 rash was observed in 3.3% of the patients. Conclusion: Biweekly administration of cetuximab, cisplatin, and 5-FU is an effective regimen with a favorable toxicity profile for the first-line treatment of metastatic or recurrent SCCHN. These results warrant further evaluation of this regimen in prospective trials. Squamous-cell carcinoma of the head and neck (SCCHN) is a significant cause of morbidity and mortality, accounting for about 500,000 new cases and 250,000 deaths each year worldwide. Surgery and/or chemoradiotherapy can cure the majority of the patients if diagnosed at a localized stage; however, the prognosis is dismal for patients presenting with metastatic or recurrent disease. Platinum-based chemotherapy had been the standard frontline treatment option for metastatic SCCHN for >30 years. In 2008, a phase III study by Vermorken et al. has demonstrated that cetuximab—a chimeric monoclonal anti-epidermal growth factor receptor (anti-EGFR) antibody—in combination with cisplatin and 5-fluorouracil (5-FU) chemotherapy prolongs survival compared to cisplatin and 5-FU chemotherapy. Currently, platinum (cisplatin or carboplatin) and 5-FU containing chemotherapy in combination with cetuximab treatment constitutes one of the standard first-line therapies for metastatic or recurrent SCCHN. The standard administration schedule of cetuximab consists of an initial dose of 400 mg/m2 followed by weekly infusions of 250 mg/m2. An alternative biweekly administration schedule for cetuximab in combination with chemotherapy is utilized in the treatment of metastatic colorectal carcinoma. Biweekly administration requires fewer hospital visits and decreases treatment costs; therefore, it is more convenient both for the patients and for the healthcare providers. Pharmacokinetic parameters of cetuximab administered at a dose of 500 mg/m2 biweekly are comparable to those of the standard weekly administration. The biweekly cetuximab schedule was evaluated in several phase II clinical trials, which were performed in patients with metastatic colorectal cancer.,,, The results of these trials suggest that the activity and the safety of biweekly administration of cetuximab are similar to those of weekly administration. Accordingly, National Comprehensive Cancer Network (NCCN) colon cancer guidelines recommend biweekly cetuximab schedule in combination with chemotherapy or as a single agent for patients with metastatic colorectal cancer. However, there are limited data regarding the activity and safety of biweekly cetuximab in metastatic SCCHN patients. In a phase II trial, biweekly administration of cetuximab 500 mg/m2 provided comparable response rate to that of standard weekly dosing of cetuximab in this patient population. In an effort to increase the tolerability while maintaining the activity, we adopted a new biweekly regimen containing cetuximab, cisplatin, and modified de Gramont schedule. In this retrospective study, we report the tolerability, safety, and efficacy outcomes of this regimen in the first-line treatment of patients with metastatic or recurrent SCCHN. Medical records of patients with metastatic or recurrent head and neck cancer treated in three oncology centers were retrospectively reviewed. All consecutive patients aged ≥18, with histologically or cytologically confirmed recurrent or metastatic SCCHN, who had received biweekly cetuximab, platinum, and modified de Gramont regimen between 1 January 2013 and 30 March 2017 were included. Patients who had received previous anti-EGFR therapy or chemotherapy for metastatic or recurrent head and neck cancer (with the exception of chemotherapy administered as a part of multimodal therapy for locoregional disease completed >6 months before initiation of study treatment) or who had nasopharyngeal carcinoma were excluded. Clinical and pathological data were obtained from medical records. The study was approved by the institutional ethics committee (#15-12.1/4), and meets the standards of the Helsinki Declaration of 1975, as revised in 2000. The treatment regimen consisted of biweekly administration of cetuximab 500 mg/m2 over 2 h, cisplatin 40 mg/m2 (or carboplatin 3.5 AUC) over 1 h, folinic acid 400 mg/m2 over 2 h, and 5-FU as a 400 mg/m2 bolus on day 1 followed by continuous infusion of 2,400 mg/m2 5-FU over 46 h. The treatment was continued until disease progression or patient intolerance as assessed by the treating physician. The administered doses of all drugs at each cycle, dose reductions, and dose delays were recorded. Computed tomography (CT) and/or magnetic resonance imaging (MRI) scans that were taken during treatment, and physical examination records were evaluated for tumor response. Best tumor response and disease progression were determined using Response Evaluation Criteria in Solid Tumors (RECIST) version 1.1. Accurate data regarding survival status of the patients and the date of death if occurred were obtained from the national registration system. All patients were evaluated for adverse events before every treatment cycle by the treating physician. Laboratory assessments (including complete blood count, serum alanine aminotransferase, aspartate transferase, total bilirubin, creatinine, sodium, potassium, calcium, albumin levels) that were performed before every treatment cycle were reviewed for toxicity. Adverse events grades were recorded according to the National Cancer Institute Common Terminology Criteria for Adverse Events (NCI-CTCAE) version 4.0. Continuous variables were summarized as median and interquartile range (quartiles 1–3). Categorical variables were reported as counts and percentages. Survival durations were estimated with the Kaplan–Meier method. Progression-free survival (PFS) was defined as the interval between the initiation of study treatment and the date of disease progression, recurrence or death from any cause. Overall survival (OS) was measured from the initiation of study treatment to death from any cause. Cumulative dose (total administered dose/body surface area), dose intensity (DI) (cumulative dose/treatment duration), and relative dose intensity (RDI) (DI/planned DI) were calculated for each drug. Statistical analyses were performed using the SPSS software (PASW Statistics for Windows, Version 18.0, Chicago, SPSS Inc.). Sixty patients with recurrent or metastatic non-nasopharyngeal SCCHN who had received biweekly cetuximab, platinum, and modified de Gramont regimen were included. The median age of the patients was 60.5 years (IQR 53.2–66.6) and 78.3% of the patients were male. Larynx (51.7%) and oral cavity (28.3%) were the most common primary sites of SCCHN followed by hypopharynx (8.3%), paranasal sinuses (5%), and oropharynx (1.7%). The median duration of disease (measured from the initial diagnosis of head and neck carcinoma to the initiation of the study treatment) was 7.6 months (IQR 2.5–16.5). For local tumor control, surgery was performed in 51.7% of the patients and 20% of the patients had received chemoradiotherapy; 28.3% of the patients had no previous treatment for primary tumor. Locoregional recurrence was present in 46.7% of the patients and was the only tumor site in 33.3% of the patients. Lymph node, lung, bone, and liver metastases were present in 56.7%, 51.7%, 11.7%, and 5% of the patients, respectively. Eastern Cooperative Oncology Groups (ECOG) performance status score was 0 in 20%, 1 in 56.7%, and 2 in 23.3% of the patients. Most patients (85%) had a history of cigarette smoking [Table 1]. Over all, 6 patients (10%) had complete response, 26 patients (43.3%) had partial response, 8 patients (13.3%) had stable disease, and 11 (18.3%) patients had progressive disease as the best response [Table 2]. Objective response rate (ORR) (complete and partial responses) was 53.3% (95% confidence interval [CI] = 40.7–65.9) and disease control rate (complete response, partial response, and stable disease) was 66.6% (95% CI = 54.7–78.5). At a median follow-up duration of 17.1 months, 43 PFS events and 31 deaths were observed. The median PFS duration was 6.8 months (95% CI 5.5–8.1) and median OS duration was 13.3 months (95% CI = 8.4–18.2) [Figure 1]. Patients received a median of 7.5 cycles (IQR 6–12) of treatment at a median duration of 19.8 weeks (IQR = 13–30). The median RDI for cetuximab was 81.6% (IQR = 68–89). 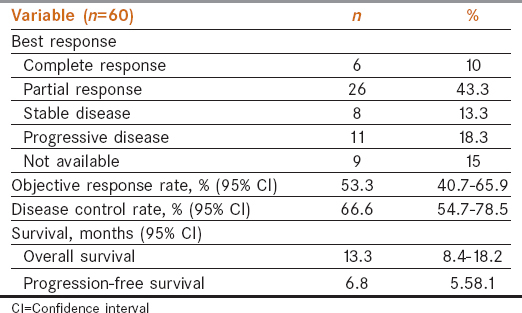 RDI of cetuximab was ≥80% for 61.7% of the patients. Five patients (8.3%) had at least one cetuximab dose reduction. Cisplatin was administered to 50 patients (83.3%) and carboplatin was administered to 10 patients (16.7%) as the platinum drug. The median RDI for cisplatin was 81% (IQR 65–90) and RDI of cisplatin was ≥80% for 56% of the patients. The median RDI for carboplatin was 83% (IQR = 73–97) and RDI of carboplatin was ≥80% for 80% of the patients. The median RDI was 80.6% (IQR = 65–89) for bolus 5-FU and 80.8% (IQR 66–87.5) for infusional 5-FU. RDIs of bolus and infusional 5-FU were ≥80% for 55% and 52.7% of the patients, respectively. 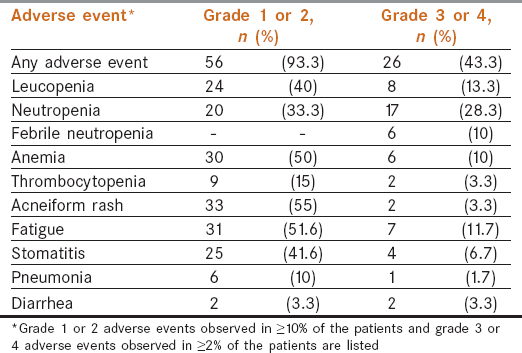 Overall, at least one grade 1 or 2 adverse event was observed in 93.3% and at least one grade 3 or 4 adverse event was observed in 43.3% of the patients [Table 3]. The most common grade 3 or 4 adverse events were neutropenia (28.3%), leucopenia (13.3%), and fatigue (11.7%). The incidence of febrile neutropenia was 10%. Granulocyte colony-stimulating factor (G-CSF) was administered as primary prophylaxis in 18.3%, and as secondary prophylaxis in 33.3% of the patients. Grade 1 or 2 acneiform rash was common (55%); however, grade 3 or 4 rash was rarely observed (3.3%). One patient experienced an infusion-related allergic reaction after the cisplatin infusion; no infusion-related reaction was reported with cetuximab. Cisplatin was discontinued in two patients due to adverse events. Eight patients died within 28 days of the last treatment; two deaths were related to pneumonia, one death was related to bleeding of the primary tumor, and five on-treatment deaths were related to disease progression. In this study, we retrospectively evaluated efficacy, safety, and tolerability of a biweekly regimen of cetuximab, cisplatin, folinic acid, and 5-FU for the first-line treatment of patients with metastatic or recurrent SCCHN. The biweekly regimen demonstrated remarkable activity; the ORR was 53.3%, the median PFS duration was 6.8 months, and the median OS duration was 13.3 months. The standard protocol, which was employed in the phase III EXTREME trial, consists of weekly cetuximab in combination with cisplatin and 5-FU administered every 3 weeks. In prospective trials, the standard protocol resulted in response rates of 32%–36%, median PFS of 5–5.7 months, and median OS of 9.7–11.6 months.,, Efficacy results of the present biweekly regimen are numerically superior to the reported outcomes of the standard regimen. Although comparing the results of different studies can be misleading, we think that these results warrant further evaluation of the biweekly regimen in a prospective study. The biweekly regimen was well tolerated, and the toxicity profile was consistent with the known toxicities of the administered drugs. At least one grade 3 or 4 adverse event was observed in 43.3% of the patients and the most common grade 3 or 4 adverse events were hematological. Of note, >80% of the patients were reported to experience any grade 3 or 4 adverse events with the standard regimen in the EXTREME and ADVANTAGE trials., Compared with these prospective trials, our patient population was older and included more patients with worse ECOG performance status. Nevertheless, the incidences of hematological adverse events were similar to those of the reported prospective trials. Grade 3 or 4 neutropenia was observed in 28% of our patients, which was reported as 22% in the EXTREME trial and 39% in the ADVANTAGE trial., Gastrointestinal adverse events including diarrhea and stomatitis were infrequent. The treatment protocol that was used in our trial incorporates two approaches which are new for head and neck carcinoma. First, we administered cetuximab biweekly. Data regarding biweekly instead of weekly administration of cetuximab come from studies performed in colorectal cancer patients.,, In the randomized phase II CECOG study, the activity and safety of cetuximab given every second week or weekly in combination with chemotherapy were found similar in colorectal cancer patients. In a recent study, Posch et al. reported a retrospective series of 31 SCCHN patients who were treated with a biweekly schedule of docetaxel and cetuximab. The docetaxel and cetuximab combination was shown to be active and tolerable. Administering cetuximab biweekly can reduce treatment costs and can be more convenient both for patients and healthcare providers as it requires fewer hospital visits. Second, we administered 5-FU as per the de Gramont regimen and combined with a lower dose of cisplatin. Although the cisplatin plus the de Gramont regimen was evaluated in various malignancies,, little data exists regarding the efficacy of this regimen in metastatic or recurrent SCCHN patients. In a phase II trial involving 35 patients with unresectable or recurrent locoregional SCCHN, the combination of paclitaxel, cisplatin, folinic acid, and 5-FU was reported to provide median OS duration of 18 months (95% CI = 14.3–21.7) and response rate of 86%. Our study has limitations. Because of its retrospective design, we were not able to standardize some measures of the treatment such as the maximum number of treatment cycles, whether or not to give maintenance treatment, and when/how to perform dose reductions/delays. Moreover, this study cannot assess whether a similar efficacy can be obtained with a sequential approach. On the other hand, this study represents data of this regimen in the real-world setting. Additionally, adverse events that are not based on laboratory values might be underdetected, as they were only recorded if mentioned by the patient. Also, we were not able to evaluate hypomagnesemia, which is a known side effect of cetuximab, because the magnesium level was not routinely measured. In conclusion, the results of this study demonstrate that the biweekly cetuximab, cisplatin, and 5-FU regimen is an effective and tolerable treatment option with a favorable toxicity profile for patients with metastatic or recurrent SCCHN. These results should be validated in a prospective trial. Echarri MJ, Lopez-Martin A, Hitt R. Targeted therapy in locally advanced and recurrent/metastatic head and neck squamous cell carcinoma (LA-R/M HNSCC). Cancers (Basel) 2016;8. doi: 10.3390/cancers8030027. National Comprehensive Cancer Network Clicical Guidelines in Oncology, Head and Neck Cancers, version 2.2016. Available from: https://www.nccn.org/. [Last accessed on 2017 Feb 17]. National Comprehensive Cancer Network Clicical Guidelines in Oncology, Colon Cancer, version 2.2016. Available from: https://www.nccn.org/. [Last accessed on 2017 Feb 17]. Tabernero J, Ciardiello F, Rivera F, Rodriguez-Braun E, Ramos FJ, Martinelli E, et al. Cetuximab administered once every second week to patients with metastatic colorectal cancer: A two-part pharmacokinetic/pharmacodynamic phase I dose-escalation study. Ann Oncol 2010;21:1537-45. Brodowicz T, Ciuleanu TE, Radosavljevic D, Shacham-Shmueli E, Vrbanec D, Plate S, et al. FOLFOX4 plus cetuximab administered weekly or every second week in the first-line treatment of patients with KRAS wild-type metastatic colorectal cancer: A randomized phase II CECOG study. Ann Oncol 2013;24:1769-77. Soda H, Maeda H, Hasegawa J, Takahashi T, Hazama S, Fukunaga M, et al. Multicenter phase II study of FOLFOX or biweekly XELOX and erbitux (cetuximab) as first-line therapy in patients with wild-type KRAS/BRAF metastatic colorectal cancer: The FLEET study. BMC Cancer 2015;15:695. Fernandez-Plana J, Pericay C, Quintero G, Alonso V, Salud A, Mendez M, et al. Biweekly cetuximab in combination with FOLFOX-4 in the first-line treatment of wild-type KRAS metastatic colorectal cancer: Final results of a phase II, open-label, clinical trial (OPTIMIX-ACROSS Study). BMC Cancer 2014;14:865. 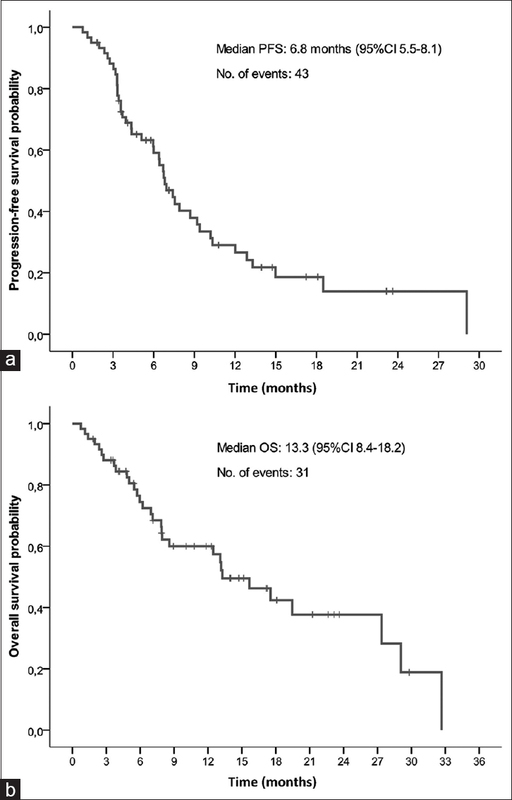 Martin-Martorell P, Rosello S, Rodriguez-Braun E, Chirivella I, Bosch A, Cervantes A. Biweekly cetuximab and irinotecan in advanced colorectal cancer patients progressing after at least one previous line of chemotherapy: Results of a phase II single institution trial. Br J Cancer 2008;99:455-8. Fury MG, Sherman E, Lisa D, Agarwal N, Algazy K, Brockstein B, et al. A randomized phase II study of cetuximab every 2 weeks at either 500 or 750 mg/m2 for patients with recurrent or metastatic head and neck squamous cell cancer. J Natl Compr Canc Netw 2012;10:1391-8. Shah MA, Janjigian YY, Stoller R, Shibata S, Kemeny M, Krishnamurthi S, et al. Randomized multicenter phase ıı study of modified docetaxel, cisplatin, and fluorouracil (DCF) versus DCF plus growth factor support in patients with metastatic gastric adenocarcinoma: A study of the us gastric cancer consortium. J Clin Oncol 2015;33:3874-9.
de Gramont A, Bosset JF, Milan C, Rougier P, Bouche O, Etienne PL, et al. Randomized trial comparing monthly low-dose leucovorin and fluorouracil bolus with bimonthly high-dose leucovorin and fluorouracil bolus plus continuous infusion for advanced colorectal cancer: A French intergroup study. J Clin Oncol 1997;15:808-15. Bouche O, Raoul JL, Bonnetain F, Giovannini M, Etienne PL, Lledo G, et al. Randomized multicenter phase II trial of a biweekly regimen of fluorouracil and leucovorin (LV5FU2), LV5FU2 plus cisplatin, or LV5FU2 plus irinotecan in patients with previously untreated metastatic gastric cancer: A Federation Francophone de Cancerologie Digestive Group Study--FFCD 9803. J Clin Oncol 2004;22:4319-28. Mitry E, Taieb J, Artru P, Boige V, Vaillant JN, Clavero-Fabri MC, et al. Combination of folinic acid, 5-fluorouracil bolus and infusion, and cisplatin (LV5FU2-P regimen) in patients with advanced gastric or gastroesophageal junction carcinoma. Ann Oncol 2004;15:765-9. Taieb J, Mitry E, Boige V, Artru P, Ezenfis J, Lecomte T, et al. Optimization of 5-fluorouracil (5-FU)/cisplatin combination chemotherapy with a new schedule of leucovorin, 5-FU and cisplatin (LV5FU2-P regimen) in patients with biliary tract carcinoma. Ann Oncol 2002;13:1192-6. World Medical Association declaration of Helsinki. Recommendations guiding physicians in biomedical research involving human subjects. JAMA 1997;277:925-6. Vermorken JB, Peyrade F, Krauss J, Mesia R, Remenar E, Gauler TC, et al. Cisplatin, 5-fluorouracil, and cetuximab (PFE) with or without cilengitide in recurrent/metastatic squamous cell carcinoma of the head and neck: Results of the randomized phase I/II ADVANTAGE trial (phase II part). Ann Oncol 2014;25:682-8. Knoedler M, Gauler T, Dietz A, Grünwald V, Stoehlmacher-Williams J, Knipping S, et al. Cetuxımab (C), fluorouracil (F) and cisplatin (P) alone or with docetaxel (D) for recurrent/metastatic (RM) head and neck cancer (HNSCC). Final analysis of AIO trial # 1108 -CEFCID. Ann Oncol 2014;25(Suppl 4):iv340-iv. Hitt R, Jimeno A, Millan JM, Castellano D, Cortes-Funes H. Phase II trial of dose-dense paclitaxel, cisplatin, 5-fluorouracil, and leucovorin with filgrastim support in patients with squamous cell carcinoma of the head and neck. Cancer 2004;101:768-75.